(REUTERS / Samsul Said)Muslim demonstrators chant slogans outside Malaysia's Court of Appeal in Putrajaya, outside Kuala Lumpur March 5, 2014. Malaysia's Federal Court has reserved its ruling on an appeal from a Catholic newspaper to use the word Allah to refer to God, an issue that had fanned religious tensions and raised questions over minority rights in this mainly Muslim country. An Indonesian religious scholar, banned in Malaysia for disagreeing with its controversial "ruling forbidding Christians using the word "Allah" ruling, described the issue as a matter borne out of confusion. He notes that the Arabic term "Allah" denoting God, existed long before the establishment of Islam. Muslims could not claim a monopoly over the term "Allah" because it was a generic term for God, according to religious scholar Ulil Abshar Abdalla. Ulil, who spoke with The Malaysian Insider on October 17, explained the roots of the term. 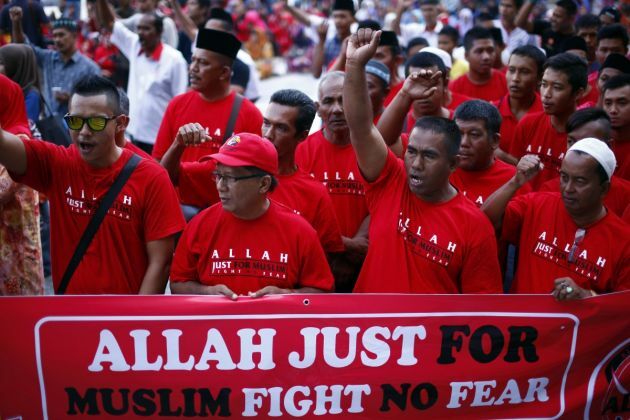 Malaysia's highest court ruled earlier this year that Allah is for the exclusive use of Muslims, who are the majority of its 30-million population. "The term 'Allah' comes from two words which are 'Al' and 'Ilah' which means God. If we mention the word Allah, it is translated as God," Ulil said in the interview. "The people of Mecca also used the word Allah before Islam came." Thus, such ruling could be construed as something brought about by a lack of information, he continued. It was impossible for Muslims to claim exclusive use of the term given its history. "If Muslims now feel that the word Allah belongs to them alone, I think that is incorrect," he said. "The Arabs before Islam also used the word Allah. (Those who hold the) view that Allah belongs to Muslims are confused." Malaysian religion minister Datuk Seri Jamil Khir Baharom explained that the country had to ban Ulil because his views ran against the Shafie school of thought, to which many Malaysians adhere. Critics assailed the government's decision to ban Ulil, with Islamic Renaissance Front (IRF) chief Dr Ahmad Farouk Musa saying the ban was an insult to their intelligence. Another critic lamented the action taken against Ulil. Former government minister Datuk Zaid Ibrahim described the government as turning on its "fundamentalist" side, saying that Malaysia seemed to have taken an extremist position on the matter. The government has yet to sanction the chief of militant Perkasa group, Datuk Ibrahim Ali, who issued a call to burn bibles that contained the word Allah.